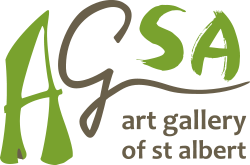 Get inspired and energized with a hands-on art class at the Art Gallery of St. Albert! Experiment with the creative process and discover and explore your favourite art medium – or try something new. We’ve got classes for all ages–from pottery to drawing, printmaking and more! Register today. Art studio classes are available all year long – register for a single class or a series. Private art parties are perfect for birthdays, special occasions, bridal parties, community groups, and corporate team-building. Get creative! Register today. Browse our class listings below. *View our community class cancellation and withdrawal policies. Check out our Summer Community Program Book! We’ve got classes for all ages–from pottery to drawing and printmaking! This booklet is loaded with classes for every age and experience level. There’s something everyone will enjoy! Register today. *Please note that a small Eventbrite fee is applied for all Community Class bookings. Summer registration will open on March 27th!